For me, one of the worst things about purchasing a new game on Steam is having to wait patiently while it downloads to my computer; it’s all precious time that could be spent actually playing the game. But now you can begin downloading titles from your Android or iOS devices while you’re at work or school so that they’re ready for you as soon as you get home. The feature is available with the latest version of the Steam beta client, and it’s supported on both Mac and Windows PCs. 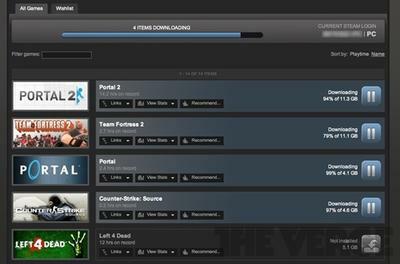 All you have to do is leave the Steam app running on your PC while you’re out — you can then use the Steam mobile client to browse the store’s catalog and manage your games remotely. Alternatively, you can use a web browser on another PC or mobile device. Valve hasn’t announced when this feature will make its way into the standard desktop client, but anyone can test out the beta right now. To enroll, you need to open up the settings menu within the Steam application on your PC, then click on the account tab. In here you’ll have the option to click a “Change…” button, which will open the “Beta Participation dialog.” Now you can select “Steam Beta Update” to enroll. The application will then restart itself and you’ll be able to use the remote management features. What do you think to Steam’s latest feature?